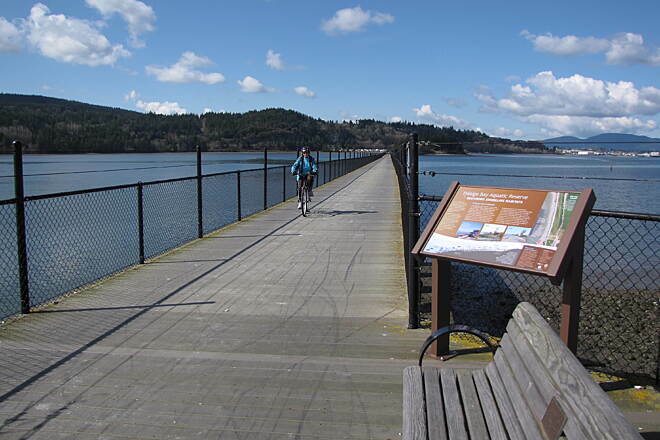 Though relatively short at 3.3 miles, the Tommy Thompson Trail stands tall in the ferry port of Anacortes for its notable 2,000-foot-long paved trestle spanning picturesque Fidalgo Bay. 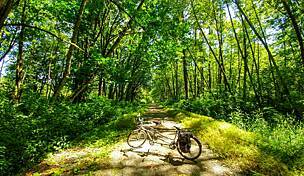 Enjoyed locally for family outings, sightseeing, and bird-watching, the rail-trail is also significant for its proximity to a Washington State Ferry Terminal (4 miles west of the trail). Those ferries to and from the San Juan Islands or Victoria, British Columbia, often carry bicyclists whose travels include the trail on the first leg of their journeys. 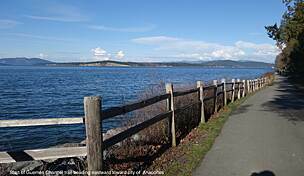 The rail-trail follows the inactive corridor of the short-lived Seattle and Northern Company line, which was built in 1890 when Anacortes boomed as a promised hub of a transcontinental railway. When investors ran out of money, the boom turned to bust. What's more, the railroad realized that a cross-country route from Anacortes wasn't feasible. The Great Northern Railway bought the short line, built the depot in 1911, and eventually merged into the Burlington Northern Santa Fe Railway, which discontinued service along the Anacortes branch. 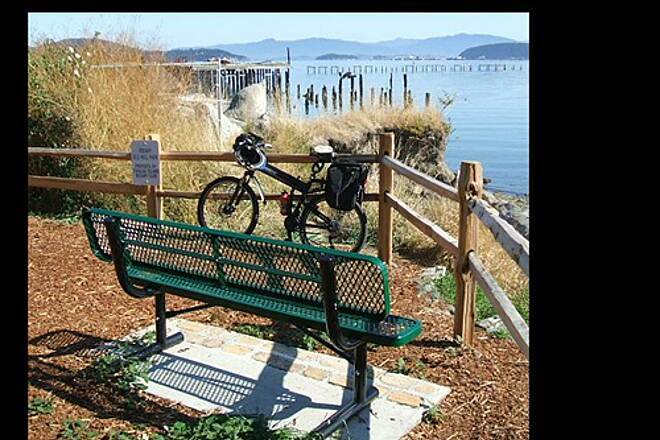 The route is named for Tommy Thompson, a passionate local railroad hobbyist who hand-built the Anacortes railway. He operated the popular six-block narrow-gage railway for some 25 years until his death in 1999. The tourist train and steam locomotive puffed within a couple blocks of today's northern endpoint for the Tommy Thompson Trail at 11th Street and Q Avenue. That's also just a few blocks from The Depot Arts & Community Center (611 R Avenue) and a block from the Port of Anacortes and waterfront. Heading south, the flat trail continues past boatyards, marinas, and other maritime businesses as it passes trailheads and parking at 22nd, 30th, and 34th Streets. 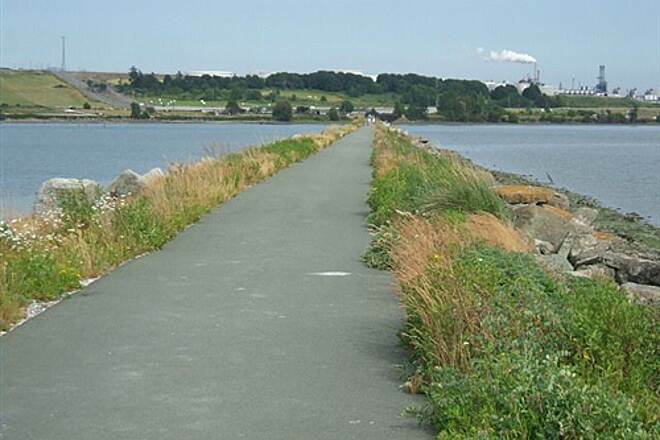 After that last trailhead, the path rolls along the shoreline below some bluffs and then crosses Fidalgo Bay on the long trestle that connects Weaverling Spit and March's Point. 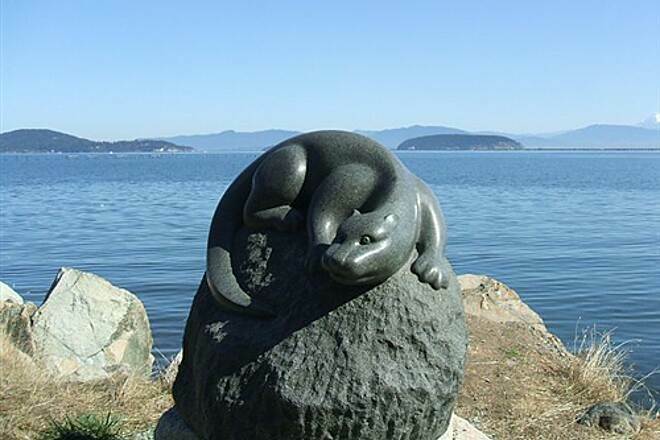 Along the way, visitors are treated to murals, trailside sculptures, and more than a half-dozen turnouts with interpretive signs that describe the local history, economy, flora, and fauna. 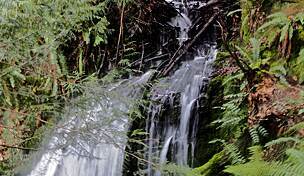 In that final mile, the forest of firs and madrones gives way to mudflats at low tide. 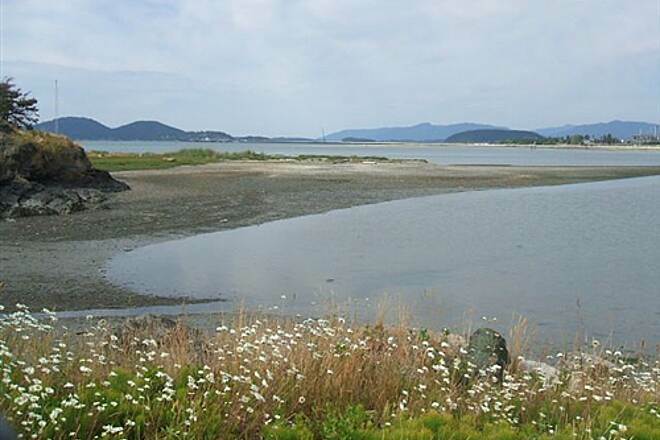 The shallow waters expose eelgrass beds and habitat for salmon, other fish, and marine animals. Snowcapped Mount Baker can be seen in the distance on clear days, while great blue herons and bald eagles fly overhead. When a mysterious fire damaged the trestle in 2009, local boosters quickly raised the money to repair it. 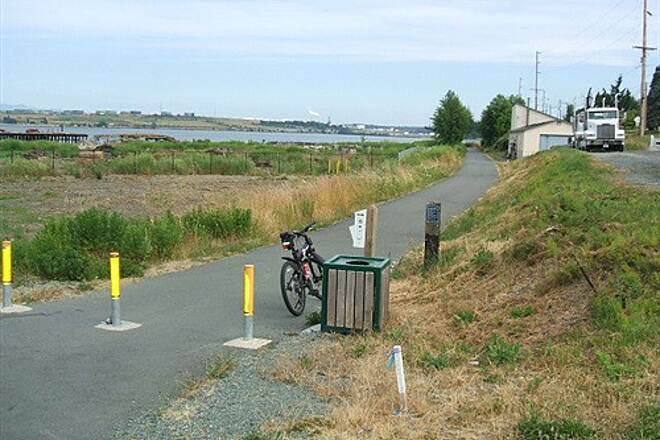 Another local fundraising effort is under way to complete the Guemes Channel Trail, which would link the Tommy Thompson Trail to the ferry terminal. From Interstate 5, take Exit 230, and turn left onto State Route 20 W. After a little more than 14 miles, turn right onto R Avenue. Turn right onto 34th Street, 30th Street, or 22nd Street to find trail parking and trailheads. 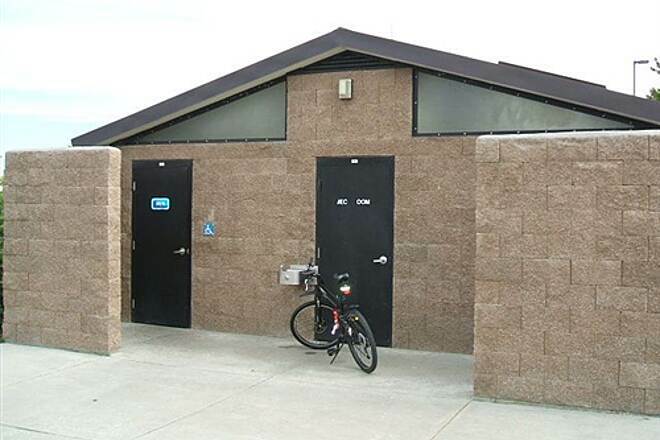 (A bus stop, water, and restrooms are available at 22nd Street and R Avenue.) Continuing north, R Avenue becomes Q Avenue, and street parking for the northern endpoint is available in the vicinity of 11th Street (1.5 miles from SR 20). There is no parking at the March's Point Road endpoint. 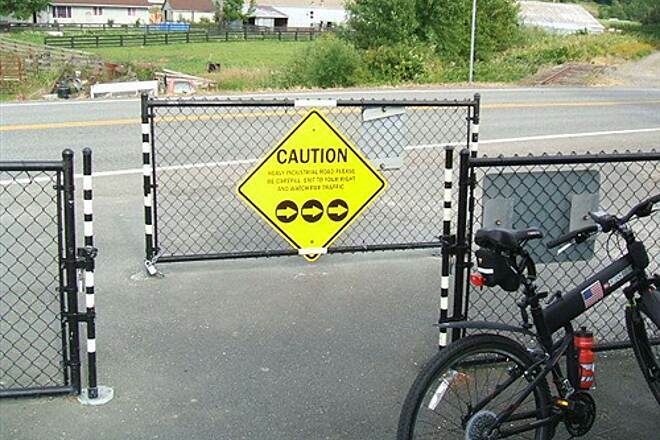 Perfect biking trail for the whole family! This trail was such a pleasant bike trail for our 10 year old kids and I to use today! It was a great way to get 4 miles on our bikes with ease, due to the nice, nearly flat grade and pavement all the way. We can't wait to go out again!The bald eagle, seal and flock of geese along the way made it just beautiful, with Mt.Baker as a gorgeous backdrop. This trail is a favorite now. I have biked this trail many times. It goes from the marina in Anacortes to the refinery following the water's edge all the way. It is completely paved and has facilities in a few spots. 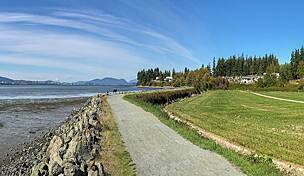 Runs right through Fidalgo Bay RV Park which is where we stay. Essentially flat the whole way. Great for the whole family to ride or walk. The most important thing to know about the trail is that the trestle has been repaired through a huge community fund-raising and volunteer effort. Here is a link to the official announcement. If you're interesting, searching the goskagit.com site will provide you with even more information about the effort that went into rebuilding the trestle. 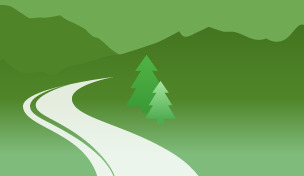 The next thing to know about the trail is why it's so important even though it's so short. The real beauty of the trail is that the trestle allows access to March's Point and points eastward without having to ride a dangerous section of Highway 20. It's not a section of road that's dangerous in terms of high fatalities - but it's not somewhere I'd ride with children, for example, or even inexperienced cyclists. Also, that section of road requires you to ride through a difficult and dangerous intersection, unless you ride on the opposite shoulder facing traffic, which is actually safer through that section of highway. Despite of (or maybe because of) the two oil refineries located on March's Point, it is a wonderful place to ride with children of all ages or while towing a trailer. 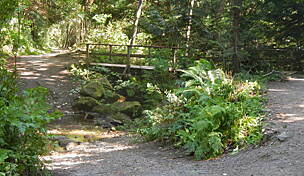 Across the trestle, around the Point and back is also a popular route with runner's. And that's why I give it a 4 star rating. I think it's a trail with huge local significance. 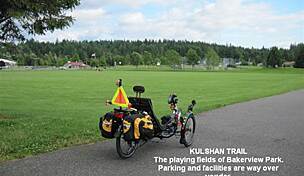 Many long-distance cycling tours begin or end in Anacortes. 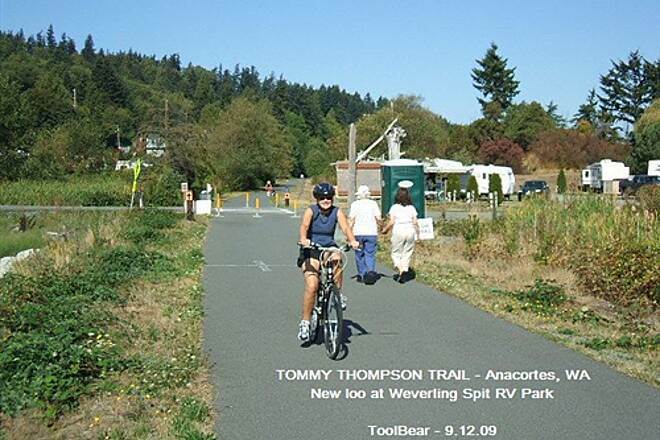 Using the Tommy Thompson Trail for access in or out of town is a bonus that makes the trip better on several counts. One important note, though. When you are crossing the trestle westbound to enter Anacortes, you first enter an RV Park. 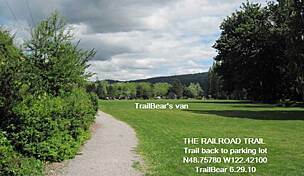 Between this park and town, the trail can be quite congested with other users - lot's of walkers, people with small children on bikes, dogs on long leashes, etc. It is not a good place to try and ride fast. 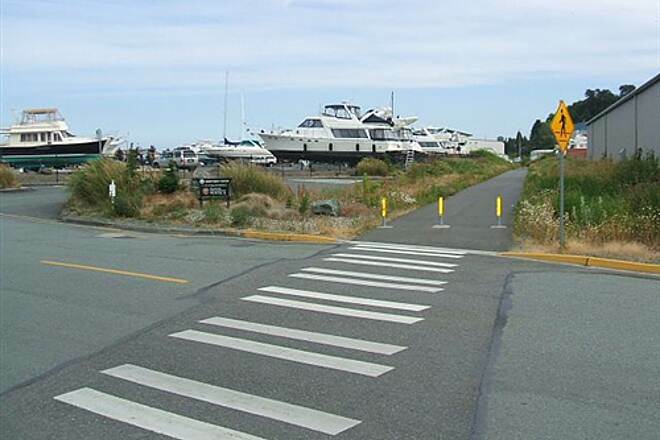 On my bike, I usually cross the trestle, then exit the RV Park by making a left turn on the RV Park entrance road, then a right on Fidalgo Bay road. This road parallel's the trail (and Highway 20) and takes you into town close to the same point as the trail. I just learned of this when contacted for the use of my pix in a fund raising effort. We have been in Winter Quarters since October. This information is on line and the link is below. 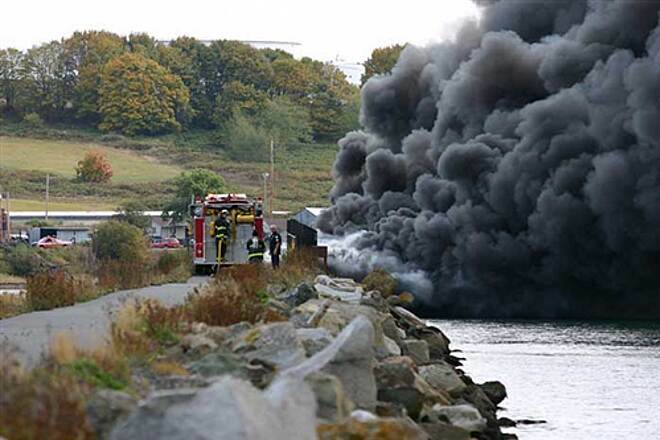 ANACORTES — A containment boom was set up to catch debris that fell from a burning railroad trestle into the water along the Tommy Thompson Parkway as firefighters worked to put out the smoldering structure that spans Fidalgo Bay. 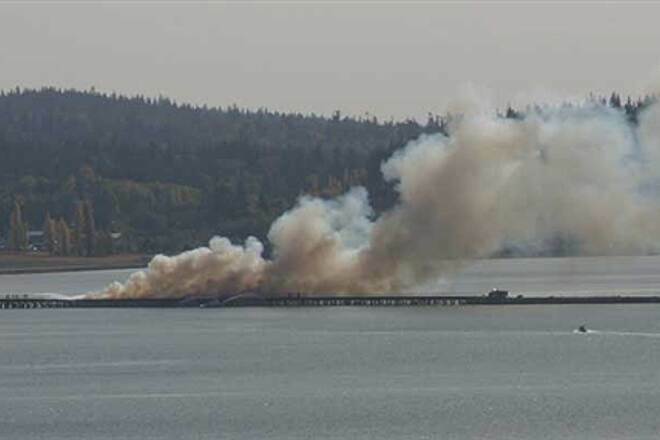 More than 200 feet of the Tommy Thompson trestle over the bay was burning, Anacortes Fire Department Assistant Chief Dan Harju said this afternoon. The state Department of Ecology set up a containment boom on loan from the Port of Anacortes in an effort to contain debris and contaminates that could get into the water because of the creosote wood preservative that coats the pilings. The blaze was burning roughly 250 to 300 feet from the rock causeway of the Thompson Parkway. Firefighters don’t know yet how the blaze started, Lt. Jack Kennedy with the Anacortes Fire Department, who is acting as the incident commander. He nor Harju would speculate on a cause. Firefighters won’t know where the fire started until after the fire is extinguished and officials conduct an investigation. 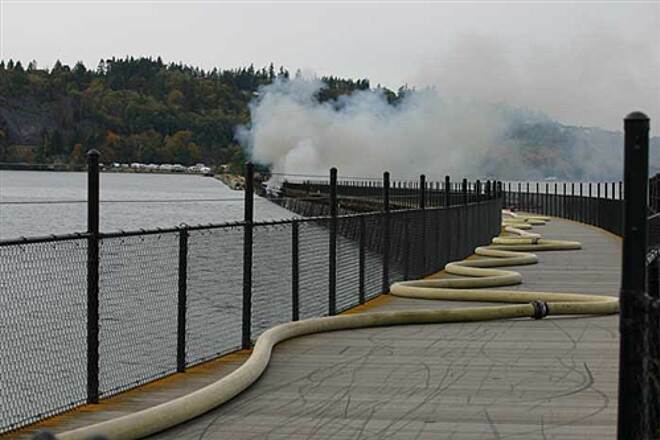 Fire hoses were stretched across the top of the causeway from the east side by March’s Point Road to the fire, and two fireboats sprayed water on the burning section of the trestle. During the afternoon, at least 20 firefighters at a time were tackling the blaze from both the east and west sides. Kennedy said when they arrived, the pilings underneath the trestle were burning. “We had accessibility issues and water supply issues,” Kennedy said. Agencies on the scene included the Anacortes Fire Department, Summit Park and Hope Island from District 13, Swinomish Police Department, the Red Cross, and the County Department of Emergency Management. Both the Shell and Tesoro refineries are assisting. 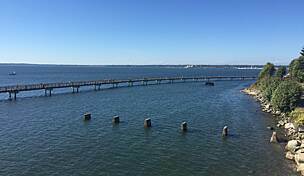 By late afternoon, fireboats on the bay were still pouring water on the smoldering trestle. 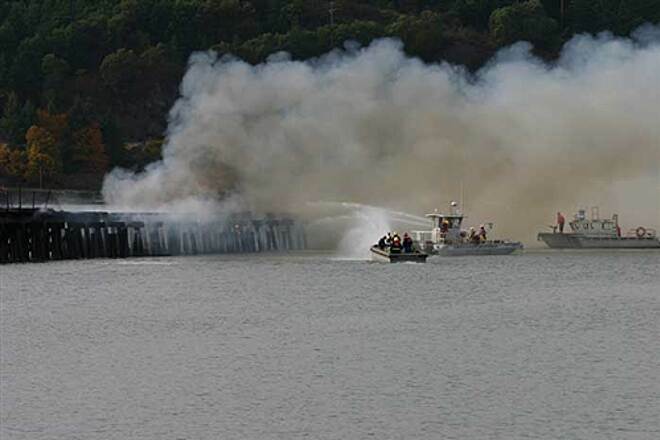 Burned debris that floated away before the boom was set up could be seen in the water near shore. 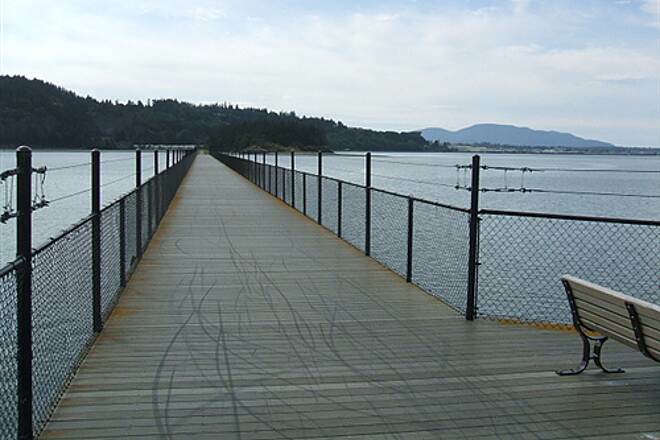 Jonn Lunsford with the Anacortes Parks and Recreation Department said the city would be blocking off both ends of the trestle with fencing so no one can go on it. “We’re mourning right now,” Lunsford said. There have been no fires on the trestle since it was restored about three years ago. But fires were reported about 10 years ago when people barbecuing dumped hot ashes on it. The TTT is a nice local ride. Folks will not travel hundreds of miles to ride it - as I did the Bizz, Row River and Banks-Vernonia, but it's a fun ride after dinner. 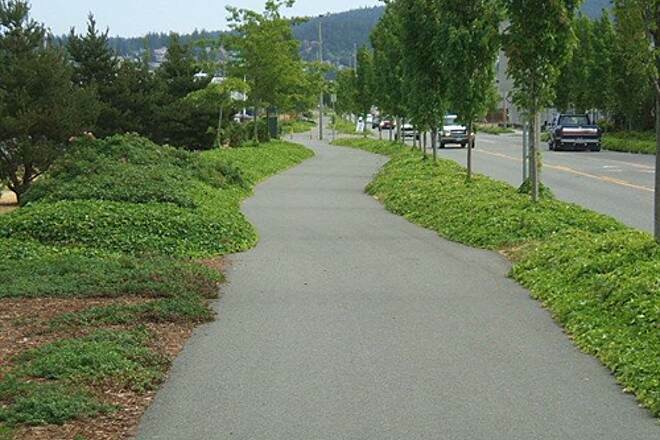 However, the trail bed is 8' of smooth blacktop and there is a lot of scenery to enjoy. If you start from the Anacortes Depot (and who does? 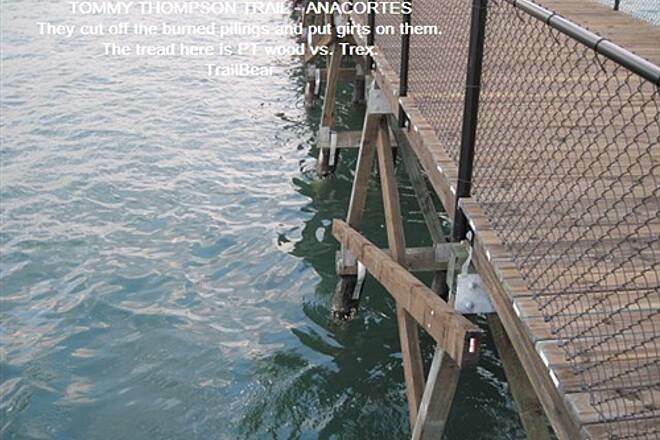 ), it's 3.63 miles out to the trail end/turn around (see photo) at the March Point side of the RR trestle. 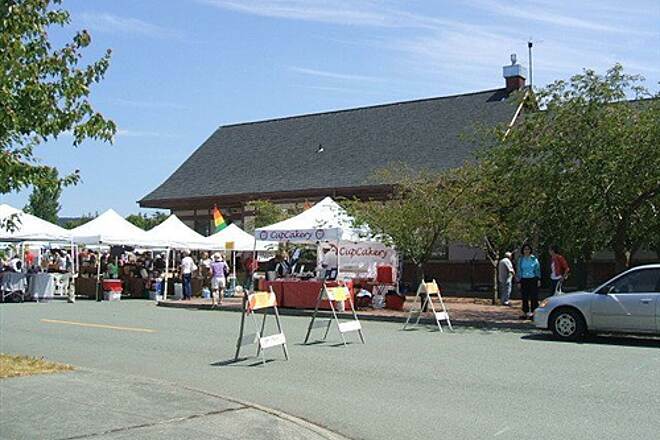 From the depot, you head down the block, go diagonal across a gravel parking lot for the Cap Sante Marina (parking, toilets, water) and pick up the 8' blacktop just across from the Safeway. No signs or such, but this is the start of the paved trail and you take it over to March Point (two refineries) where the trail ends. The trail follows Q Ave to 22nd St. Here you will find parking, a bus stop, public toilet and drinking fountain. 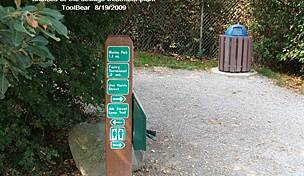 This is commonly used as a trail head. No signs. Cross the street and you are into the marine industries district. That monster unused building to the left once assembled modules for the North Slope. 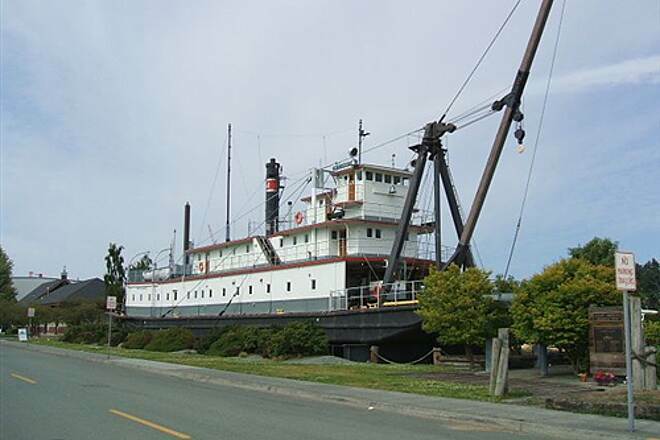 They were barged to Alaska from the waterfront there. There is a skate park to the right where the kids do amazing things on wheels. Next stop is a trailhead (parking) called Soroptomist Station, down in the heart of boat land. At M 1.67 you leave the boat industries astern and start the Along the Water/Under the Bluff section. Benches are spaced here and there. 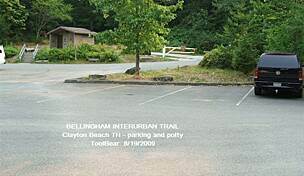 There is informal on-street parking here - sort of a trail head for this section. The waterfront rubble here is what is left of an old plywood mill that suffered a strange fire. 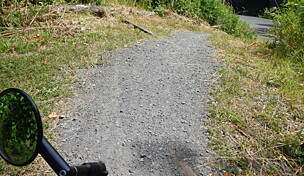 The TrailLink map shows a trail head in the section ahead. Not so. It's an RV park at the base of Weaverling Spit. 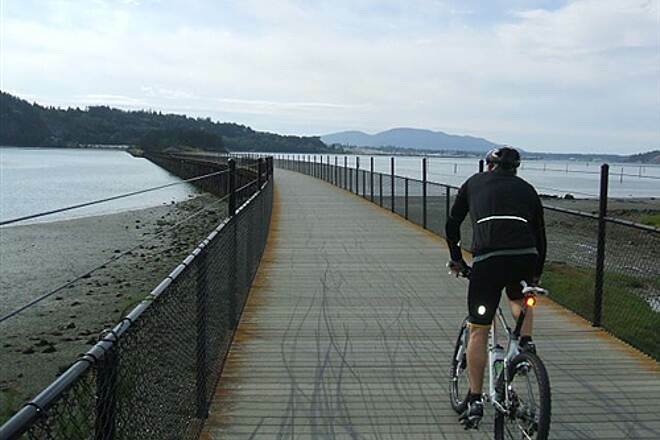 The trail runs thru it and heads out to the end of the spit, then onto the trestle for a saltwater crossing of Fidalgo Bay. They have done a nice job on the trestle. Turnouts with benches are on both sides. At M 3.63 the trail ends at the end of the trestle. You can see why there is no trail head here - where to put it. The two lane road is built up. Flat ground is hard to come by. You can turn about here or ride around March Point (roads). Another option is to turn right on the March Pt. Rd. in front of you (2' shoulders), ride out to Hwy 20 at the base of the bay (3-4' shoulders), turn right on 20 and follow it around the head of the bay until Fidalgo Bay Rd. opens to the right (shoulders??). It will take you back to the trailer park on the spit and you can rejoin the TTT there.